How should Ontario invest in energy? How Ontario’s government should invest its money is a topic of constant contention. Considering options requires that we understand some of the available solutions. 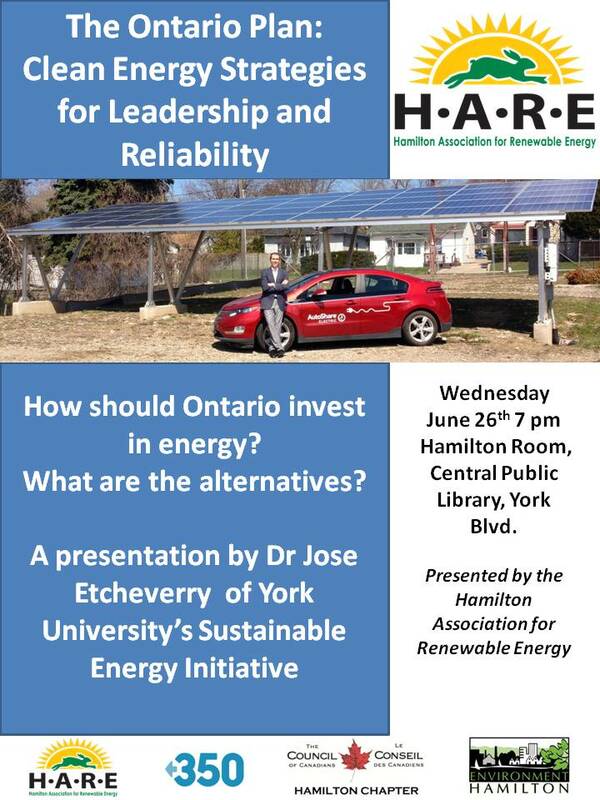 To provide more information, Hamilton Association for Renewable Energy (HARE), Environment Hamilton, The Council of Canadians (Hamilton Chapter), and Hamilton 350 have joined forces to bring Jose Etcheverry of the York University Sustainable Energy Initiative to Hamilton for a presentation. The presentation will take place on Wednesday, June 26, from 7pm to 9pm. It will be held in the Hamilton Room of the Hamilton Public Library (Central Branch) York Blvd. (map). Dr. Etcheverry and his colleagues conduct research into energy conservation and efficiency, renewable energy and climate change. His talk will focus on how Ontario can develop renewable energy to its full potential. Ontario’s Green Energy Act sets out to reduce pollution from coal-burning power stations and encourage the use of renewable energy. Natural gas power stations provide most of the current replacement power. Although natural gas burns cleaner than coal, it still has problematic extraction processes and produces greenhouse gases. The main sources of renewable energy are hydro, wind, solar, biomass and geothermal. Hydro is long-established in the Province, providing over 22% of our electricity demand. Wind is currently producing 4.3% (source: Independent Electricity System Operator – IESO). Our current largest electricity source is nuclear, which supports over 55% of Ontario’s needs. Nuclear is a good alternative when looking at greenhouse gas avoidance, but carries a number of troubling issues including capital costs, radioactive waste management and the finite uranium supply. Thorium, an alternative to uranium, has been in the research stage for decades. There is some promise, including a Canadian firm, Thorium Power Canada, which is working with Chile and Indonesia (Thorium reactors could soon power Indonesia, Chile). HARE believes that renewable energy sourcing needs must be greatly expanded if we are to combat the growing threat of climate change due to greenhouse gas production. European countries such as Germany and Denmark are making great use of various renewable sources of electricity. Germany, which is further north than Ontario’s Golden Horseshoe, set a solar electricity production record on April 15, 2013 by producing 22.68 gigawatts (brief article from Clean Technica on this achievement). Renewable energy in Germany made up approximately 16.2% of total generation in 2012 (source: Fraunhofer Institute for Solar Energy Systems ISE). In comparison, Ontario’s total electricity generation capability is 19.05 gigawatts (source: Ontario Power Generation).